1. Given here are some figures. 2. How many diagonals does each of the following have? (a) A convex quadrilateral: It has 2 diagonals. Let ABCD be a convex quadrilateral. We observe that the quadrilateral ABCD formed by two triangles i.e. ΔADC and ΔABC. Let us take another quadrilateral ABCD which is not convex and join BC which divides it into two triangles ΔABC and ΔBCD. Thus, this property hold if the quadrilateral is not convex. 5. What is a regular polygon? A polygon having sides of equal length and angles of equal measures is called regular polygon. (i) A regular polygon of 3 sides is equilateral triangle. 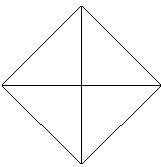 (ii) A regular polygon of 4 sides is square. (iii) A regular polygon of 6 sides is regular hexagon. 6. Find the angle measure x in the following figures. (a) The figure is having 4 sides. Hence, it is a quadrilateral. (b) The figure is having 4 sides. Hence, it is a quadrilateral. Also, one side is perpendicular forming right angle. (c) The figure is having 5 sides. Hence, it is a pentagon. Two angles at the bottom are linear pair. (d) The figure is having 5 equal sides. Hence, it is a regular pentagon. Thus, its all angles are equal. 1. Find x in the following figures. The figure is having five sides and is a pentagon. 3. How many sides does a regular polygon have if the measure of an exterior angle is 24°? Thus, the regular polygon have 15 sides. 4. How many sides does a regular polygon have if each of its interior angles is 165°? Thus, the regular polygon have 24 sides. 5. (a) Is it possible to have a regular polygon with measure of each exterior angle as 22°? No, we can't have a regular polygon with each exterior angle as 22° as it is not divisor of 360. No, we can't have a regular polygon with each exterior angle as 158° as it is not divisor of 360. 6. (a) What is the minimum interior angle possible for a regular polygon? Why? (a) Equilateral triangle is regular polygon with 3 sides has the least possible minimum interior angle because the regular with minimum sides can be constructed with 3 sides at least..
(b) Equilateral triangle is regular polygon with 3 sides has the maximum exterior angle because the regular polygon with least number of sides have the maximum exterior angle possible.